Questions or Comments? Let us know at seca@juniata.edu. Juniata has dozens of clubs and organizations on campus that give students the opportunity to develop different skills, support various causes, grow as a person, make friends and/or just have fun! There's so much to choose from - and if for some reason you don't find what you're looking for, you can start your own group! A short description of each RSO is found at the bottom of this page. If you would like more information about each club, please complete the application form on the left hand side of this page. American Association of University Women: Juniata’s AAUW club is a local chapter of the larger national organization advancing equity for women and girls through advocacy, education, philanthropy and research. The Juniata club works toward this mission by collaborating with the AAUW Huntingdon branch and other campus groups to host events for the campus and community on issues relevant to women. Colleges Against Cancer: Colleges Against Cancer is an extension of the American Cancer Society and seeks to carry out its mission statement by spreading cancer awareness between the college campus and surrounding community. Here at Juniata, the Colleges Against Cancer club hosts several events including Breast Cancer Awareness Week. Environmental Coalition: Environmental Coalition is a dedicated to making Juniata a more sustainable and environmentally aware community through community events and education on campus. Juniata College Democrats: The mission of the Juniata Democrats is to advocate for Democratic issues on campus and get students to actively participate in the political process. Juniata College Republicans: The Juniata College Republicans are a group of students whose mission is “to foster an environment for political discussion, to provide students and the community to be active participants in the political world.” They host meetings, speakers, discussions and debates to empower Republican students on campus. Omicron Delta Kappa (The National Leadership Honor Society): Students invited to this club, based on GPA and leadership experience, participate in an annual service project and wear an honor cord at graduation. They have the opportunity to attend an additional alumni networking event at which they can learn about Alumni Council, an organization that they may be encouraged to join after graduation. PAX-O (Peace Studies Club): The mission of PAX-O is to promote peace and social justice through awareness campaigns, campus discussions, events, and participation in both local and global social justice movements and organizations. They desire to engage in peace-building processes on the interpersonal, local, community and global levels. Plexus: Plexus is a social justice advocacy organization that is loosely affiliated with Plexus orientation, one of Juniata’s extended orientation sessions that focuses specifically on helping multicultural students deal with culture shock upon arrival at Juniata. The club works closely with other organizations to support Kwanzaa and Freedom Seder and they assist with multiculturalism workshops. PRISM: The purpose of PRISM is to serve as a social and activist student club for individuals who identify as a member of the LGBTQIA community. They work together to make Juniata a more open and safe community by increasing awareness and acceptance of LGBTQIA people and education the campus community. They sponsor activities and programs on campus which provide opportunities for members of the LGBTQIA community and their allies to meet with each other. Women in Physics: Women in Physics is a club that advocate for the women in physics. Art Alliance: The Art Alliance Club holds value in the positive effects of recreational art making and hopes to inspire a more creative and stress free atmosphere for those involved in the club. The club aims to utilize a combination of small and large monthly art projects to enhance student friendship, imagination and fun. Dance Ensemble: Dance Ensemble is a student run club with a mission to create, inspire, and spread a passion for dance. As a member of Dance Ensemble you have the opportunity to participate in classes, recitals, kickline performances at sporting events, Mr. Juniata, Relay for Life, and more! The club offers a variety of classes, such as jazz, tap, contemporary, modern, ballet, and hip-hop. They even offer a free Zumba class open to all! Whether you've been dancing since you were three or want to try it out for the first time, Dance Ensemble is the place for you! Drop the Mic: To encourage and facilitate the creative growth and exchange of and between students, and to foster an appreciation for different forms of verbal performance, cultures, identities and ways of life. Juniata College Knitting Club: The Knitting Club meets weekly and provides a place where students can relax and knit for an hour or two each week. Members’ skill ranges vary from beginner to expert and non-knitters are welcome to come learn the craft. Juniata Game Developers: Juniata Game Developers is a club dedicated to teaching its members the skills necessary for video game development. The methods may change frequently, but they generally include: giving or sharing tutorials for various design aspects, making or purchasing assets for use in the games being built, bringing people together in order to quickly locate needed group members, and setting up fun events to ensure that they can produce a substantial amount of smaller games or a few larger-effort games. Mud Junkies: Mud Junkie’s mission is to teach both wheel thrown and hand built ceramics to students who are interested or already have experience working with clay. It provides a chance for students with past experience to have the freedom to create their own pieces, while also allowing the members to share their knowledge and love for ceramics to anyone who wants to learn. In the spring of every year, the club assists in throwing bowls for Empty Bowls, a dinner that raises funds for hunger in the communities surrounding Juniata. At the end of each semester, Mud Junkies hosts a sale of student pottery and ceramics projects. Social Dance Club: The Social Dance Club promotes social dancing at all levels in a safe and friendly environment. Croquet Club: To allow students to better themselves in a relaxed environment to relieve the pressures created through the college atmosphere. Fit Lab: FitLab is dedicated to the athlete in everyone and we believe that personal growth must encompass the whole person and be integrated to accelerate growth. They are committed to creating an inclusive, supportive, and non-compettitive environment that encourages everyone, regardless of fitness level, to achieve their very best. They believe that for true health, fitness, and well being to flourish, all must be committed to bettering the community and will engage directly to improve the lives of others. JC Divers: The Juniata College Divers Club works with a local instructor so that students can become certified divers at a reasonable price. The club goes on trips where they can scuba dive, snorkel and free dive to expand their skills and confidence. The club host Discover Scuba Diving nights at the pool where anyone is able to try out scuba diving to see if they want to become certified. Juniata College Cycling Association (JCCA): JCCA exists to provide an organized and supportive cycling community at Juniata College. The club welcomes any and all forms of cycling, from road to mountain to BMX to those just looking for a fun activity. The club aims to spread awareness of cycling not only in the college community, but also in the town of Huntingdon. Juniata College Poker Club: The Juniata College Poker Club is primarily a place for students to gather and socialize while playing poker, casually or competitively. It is the mission of the club to shift the public view of poker away from a form of gambling towards what it truly is- a game of social strategy. The club will focus on the most well-known and celebrated form of poker- Texas Hold’em, but also introduce members to other variations of poker. Juniata College Soccer Club: The Soccer club goal is to teach members the proper way to play soccer as well as just play soccer. Juniata College Men’s Rugby- Intercollegiate: The Juniata Men’s Rugby club strives to create an environment for rugby to be learned and played at a competitive level. They are known as “The River Rats” on campus. Ping Pong Club: The Ping Pong Club is about teaching members the official sport of Ping Pong. The club also helps members improve their skill. Quidditch Club- Collegiate: The mission is to bring Harry Potter fans and sports fans together to play Quidditch. You will play other college teams while learning cooperation, sportsmanship and continually growing and improving as a team. Ultimate Frisbee- Intercollegiate: The Ultimate Frisbee Club provides an inclusive and enjoyable team for an amazing sport. The club provides a competitive environment at tournaments for those who want to play more than pickup games. This club is famous for their nearly constant pickup game on the campus quad. Women’s Rugby- Intercollegiate: The Juniata College Hellbenders are the Juniata College Women’s Rugby team. The purpose of this team is to provide athletic activity for those women who want to play rugby and join a supportive team environment. This gives women the chance to participate in a competitive, yet fun sport and to promote a friendly atmosphere. 92.3 WKVR: The goal of WKVR is to service Juniata and the Huntingdon area with music and talk radio. The club introduces students DJs to the basics of broadcast media as they develop their own voice and style on air. Communication and Media Club: Juniata’s Communication and Media Club has provided an outlet for students to be involved in a club that focuses on human interaction and media studies. They encourage cohesion among students of various disciplines through communication. The club aims to provide opportunities for students to network with alumni and other students to further develop their understanding of the Communication & Media fields. The club host events relevant to many of the classes offered such as Soapbox speeches, the Bailey Oratorical and alumni panel. 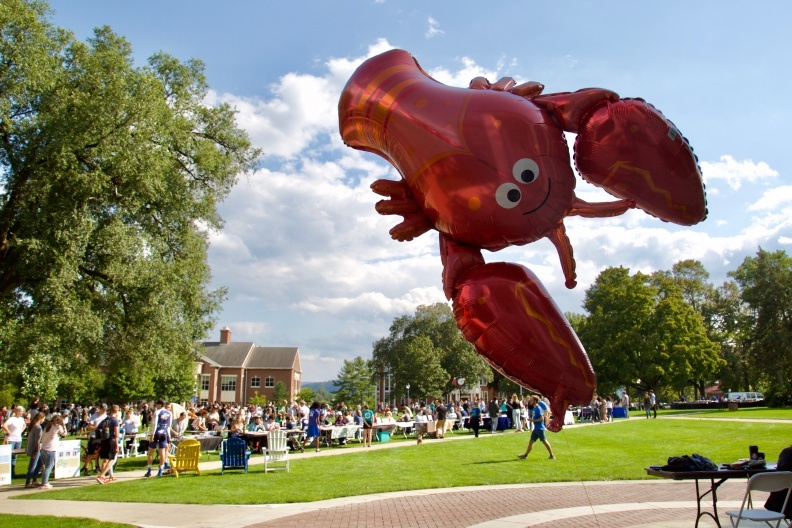 Juniata Activities Board (JAB): The Juniata Activities Board works closely with the Office of Student Engagement to plan most of Juniata’s major events from traditions like Mountain Day, Lobsterfest and Madrigal. Each year, they also work to bring in a wide range of entertainment such as comedians, musicians and poets so that students are able to relax and unwind in a fun and interactive atmosphere. Young Business Minds: It’s more than a job, it’s a mindset. The Young Business Minds is a club of innovative and creative thinkers that want to work together to create solutions for problems we see everyday. Chinese Club: Juniata’s Chinese Club offers students and citizens of the surrounding community with opportunities to experience the Chinese culture. They also devote effort to providing a family atmosphere for incoming Chinese students. They welcome all members of the community who are interested in celebrating, learning and sharing the Chinese culture. French Club: The French Club is a club where students who are interested in French are able to get together and have some fun. They promote Francophone language and culture to our community, here at Juniata, as well as the Central PA area. German Club: The German Club is a cultural club on campus that focuses on the culture of the German speaking countries: Germany, Austria and Switzerland. They organize and hosts several events each year. Globalization Alliance: The Globalization Alliance seeks to provide experiences that bring together the increasingly global Juniata population. They focus on events and excursions that allow people to both share their divergent cultures and find the common ground between them. The club organizes trips, conversation groups and events on campus to focus on forming relationships between students from around the world. Japanese Club: The Japanese Club offers the community the opportunity to experience the Japanese culture. They host several events through the academic year such as the Japanese Dinner. Juniata College Russian Club: The Russian Club represents Russian culture on campus. It is a place where students of Russian, students from Russia, and any other students interested in the country or the language can connect through club activities. Juniata Anime Club: The Otaku Culture club’s mission is to provide members an environment that both allow them insight into the pop-culture of Japan, as well as relaxation through the interaction and appreciation of said culture with others. Korean Club: The Korean Club helps the Juniata community experience a piece of Korean culture through food and entertainment. Sign Language Club: The Sign Language Club at Juniata College works to increase awareness of signed language and Deaf culture. The club hopes to provide a welcoming environment for members of the Huntingdon community who want to increase their knowledge of ASL. Everyone is welcome, regardless of experience. Spanish Club: The aim of the Spanish Club is to communicate and celebrate the Spanish language, culture and heritage from various Spanish-speaking countries. They hold various events that celebrate the culture and emphasize not only bringing in native speakers, but also opening up our events to the general public so that everyone can participate. Umoja: Umoja is committed to providing a safe space for Juniata’s ALANA population and its allies. The club engages in discussions about current social and campus-centric issues that may directly impact our students of color. The club encourages students of all backgrounds to attend and learn from each other through dialogue and to form relationships. Vietnamese Club: Vietnamese Club is a great introduction to the culture. JC Pokémon League: The Pokémon League provides a setting that promotes the interaction of individuals who enjoy what they Pokémon culture has to offer through its many mediums. The members are able to relax and enjoy the time spent at the club in order to ease stress from their academic lives. Juniata College Star Wars Club: The Juniata Star Wars Club wants to celebrate and enjoy a franchise that has shaped the film industry and society as well as make Star Wars more accessible to those outside its fandom. Their most popular event include light saber battles. Ministry of Games: The Ministry of Games devotes its time creating a friendly atmosphere for casual and intense gamer alike by providing them with the means to play games and a place to play the games. Board games, card games, and Magic the Gathering strategy card game are the focus of the club. The club owns several board and card games that are available to each member during the club sponsored events. Archery: Archery Club is intended to provide a place where archers of any level of experience can come to shoot. At club meetings learning and improvement is encouraged and opportunities for participation in tournaments are provided. JC 5Rivers: The goal of the JC 5Rivers is to preserve, protect, conserve and enjoy the waters in the Juniata area. The club is a group that just really loves to fish in any way they can. Juniata College Disc Golf Association (JCDGA)- Intercollegiate: Formed in 2012, this club is composed of individuals that enjoy playing the sport “Disc Golf.” Disc golf is a sport similar to “ball golf,” but instead of trying to get a ball in a hole in the fewest strokes possible, a Frisbee is thrown into a basket. The club welcomes players of all skill levels. Juniata College Equestrian Club: The Equestrian club exposes people to the world of horses and has fun through equestrian activities. They also strive to get opportunities such as lessons and trail riding available to those who wish to participate. Juniata College Marksmen’s Club: Juniata Marksmen’s Club is a club dedicated to teaching safe firearm handling while enjoying the sport of shooting and introducing shooting to new members. Juniata Ski Club: JC Ski Club is a club open to anyone interested in skiing or snowboarding with skill ranging from beginner to advanced level. Each year the club takes a trip over winter break to a ski resort. Laughing Bush: To provide outdoor recreational equipment and activities to the student body. The Wild Hunters of Juniata: The Wild Hunters of Juniata is a student organization based upon early Eastern Woodland American Indian and Mountain Man outdoor skills and culture. Members focus on surviving in the wilderness with only the clothes on their backs and using the resources Mother Nature provides. The club teaches basic survival skills. American Society of Biochemistry & Molecular Biology (ASBMB): Advance the science of biochemistry and molecular biology through publication of scientific and educational journals, the organization of scientific meetings, advocacy for funding of basic research and education, support of science education at all levels, and by promoting the diversity of individuals entering the scientific workforce. ASBMB goal is to support these ideals through funding students for scientific meetings, raising advocacy and funding for basic research and education at a smaller scale through events and sharing science with people of all educational levels. American Society for Microbiology (ASM): The American Society for Microbiology is the largest and oldest life sciences organization in the world and is aimed at advancing and disseminating an understanding of the microbial world. The ASM Club is composed of students interested in the microbial and biological sciences. They support activities relating to spreading knowledge in the field, student research and conference attendance. Andrew Lawson Geological Society: The mission of the Andrew Lawson Geological Society is to bring the geology department together through recreational activities, as well as integrating non-departmental students who have an interest in geology. Apiary Club (Bee Team): The Apiary Club is a group of students and staff who spend time learning about the process of keeping and maintaining a beehive and using the products of that hive. Since bees play a very important role in society, club members also seek to keep people educated and aware of their significance. Brewniata: Brewniata’s mission is to provide students with a basic, hands-on brewing experience by informing them about the history, culture, and techniques derived from brewing beers. Chemistry Club: The mission of the Chemistry Club shall be to afford an opportunity for students of a chemical science and all educational backgrounds to become better acquainted and to foster an awareness of the responsibilities and challenges of the modern chemist. The club’s biggest even is the Chemistry Camp where area elementary school students visit Juniata’s Campus, participate in lab activities and attend a demo show. Health Occupations Students of America (HOSA): The mission of HOSA is to enhance the delivery of compassionate, quality health care by providing opportunities for knowledge, skill and leadership development of all health science education students, therefore, helping the student meet the needs of the health care community. HOSA is a national organization with state chapters at the secondary, post-secondary, and collegiate levels. Juniata College Student Chapter of Wildlife Society: The mission of the Juniata College Student Chapter of the Wildlife Society is to promote professionalism in our membership through experience, networking, conservation awareness and education in a fun and enjoyable atmosphere. Our members develop and promote sound stewardship of wildlife resources and of the environments upon which wildlife and humans depend. Juniata Stargazers Astronomy Club: The Astronomy Club provides a forum where students interested in astronomy can communication with each other and learn techniques from the faculty advisor, peers, and community members. The club will aim to broaden the availability of the observatory, a valuable college asset that is otherwise underutilized. The club will also strive not only to provide educational opportunities to interested club members, but also to the Juniata and Huntingdon community as a whole. Null Set: Null Set is a club that sponsors mathematical activities and encourages studies in mathematics. They promote mathematics at Juniata and the greater Huntingdon community in a fun and safe environment. Pre-Veterinary Medicine & Animal Science: The Pre-Vet Medicine & Animal Science club engages in discussion, education and exploration of the fields of animal science and veterinary medicine. The Society of Physics Students: Society of Physics Students is the Juniata chapter of a national organization designed to offer physics students the chance to expand their educational experience by offering information about internships and job opportunities in physics. Juniata’s SPS chapter focuses on outreach to get the public, especially children, interested in learning more about science. Physics Phun Night, featuring fantastic physics demos, is their most popular event. Tri-Beta: Tri-Beta promotes and extends the interest and knowledge of biology and supports those wishing to partake in the field. Tri-Beta is the Juniata chapter of the National Beta Beta Biology Honors Society. Amigos de Guanin: Amigos de Guanin aims to serve and raise awareness for an underdeveloped, rural community in the Dominican Republic. Campus Girl Scouts: Campus Girl Scouts is a service and volunteer club for students who served as Girl Scouts in high school. Although they no longer seek badges, these young women support Girl Scout troops in the area to build girls of courage, confidence, and character whom make the world a better place. Caring for Kids with Cancer (CFKC): Caring for Kids with Cancer is a chapter of a local non-profit organization. Their mission is to help children with cancer and their families get through the hard times that cancer brings. All their events and funds go to supporting their efforts in helping those children. Eco House: Eco House is an opportunity to live in a coed intentional community focused on living sustainably. They focus on small projects and cleaning up the cliffs regularly. Habitat for Humanity: Juniata’s chapter of the national organization, Habitat for Humanity works on local building sites in the surrounding community. Habitat International seeks to bring people together to build homes, communities and hope through a forum of faith. JC Emergency Medical Services (JCEMS): JCEMS is composed of students on campus who have an interest in emergency medicine. They strive to provide trained, quality medical care to the Juniata College community. Juniata Instructors of the Future (JIF): JIF is dedicated to fostering the development of all education majors for the betterment of the community. They are dedicated to helping their members become more actively involved students on and off campus. National Society of Leadership and Success (NSLS): The NSLS club’s mission is to build leaders who make a better world. They host several speakers during the year. Pet and Animal Welfare Society (PAWS): PAWS spends time volunteering at nearby rescues and shelters. They raise funds for and provide education about animal welfare in a national, state and local context. They are trying to improve animal welfare. Pre-Law Club (Barristers Club): The Barrister’s Club is a student organization for students who are interested in law or exploring the possibility of attending law school. The club serves by providing information regarding LSAT prep courses, law school admission processes, law school tours and career information. Social Work Club: The social work club is an active organization that unites a network of professionals to advocate for social justice and equality throughout Juniata College and beyond. The members participate in activities that promote awareness of social work practice and community service. The Social Work Club welcomes all students who seek a compassionate and welcoming environment, and who are interested in engaging in the campus and greater community. These students work towards helping others and becoming change agents in today’s society. Catholic Council: The Catholic Council helps Catholic students develop their personal roles in the faith community. They facilitate programs which provide for the spiritual and social enrichment of Catholic Students. They promote an awareness and understanding of Catholic ideals to the college and general communities and to recognize and value the diversity of Christian and non-Christian faiths. Hillel: Hillel mission is to enrich and educate about Jewish life at Juniata. Juniata Christian Fellowship (JCF): The Fellowship offers the space and opportunities for students to grow spiritually through fun activities, insightful discussion, community service, and conference participation with a Protestant Christian focus. Unitarian Universalist Union (UUU): The UUU intend to incorporate the 7 principles that define what Unitarian Universalism means in order to work together to inspire justice, equity, and compassion through interfaith dialogue, human connections, and action in local and global community. Philosophy Club: To promote rational philosophical thought as beneficial to the life and careers of Juniata students and to discuss readings we come across in our own explorations, as well as to create a forum for discussion of our own philosophical thoughts and issues.